Despite the Donald Trump administration’s determination to roll back as many environmental protections and regulations as possible, a substantial number of companies are interested in supporting regulations that help protect the environment. Most TriplePundit readers are likely familiar with the letter signed by nearly 400 companies, nonprofit organizations, colleges, and universities asking President Trump to ensure the U.S. remains dedicated to the Paris climate agreement, as well as policies that fight climate change. With looming federal cuts and the imminent closure of the EPA’s environmental justice office, our air, water and public lands need all the help they can get. How can companies and nonprofit organizations help pick up the slack even further? The good news is that concerned citizens have the opportunity to join forces by choosing to support companies and organizations working against climate change and systemic oppression. There are a few ways you can do this: by not only choosing to patronize brands that value people over profit when we can, but also by becoming citizens who are more involved in our democratic process, by divesting from fossil fuels and supporting companies that divest from fossil fuels, and by joining the staff of a company or organization that works toward furthering sustainability and human rights efforts. Here are a few examples of how to apply these concepts in concrete terms. I was going to dedicate a section of this article to how much of a difference we can make by supporting ethical companies. However, I’d rather focus on how all consumerism is largely a distraction — ‘conscious’ or not — and how it’s more important to call or fax our representatives, attend town hall meetings, donate to causes we believe in, and vote. Of course, part of being an active part of our community is to support local growers at farmers’ markets and other local goods manufacturers and small businesses. However, if we want to help enact lasting change, we need to spend less time shopping for objects online and more time speaking out about issues that matter to us. 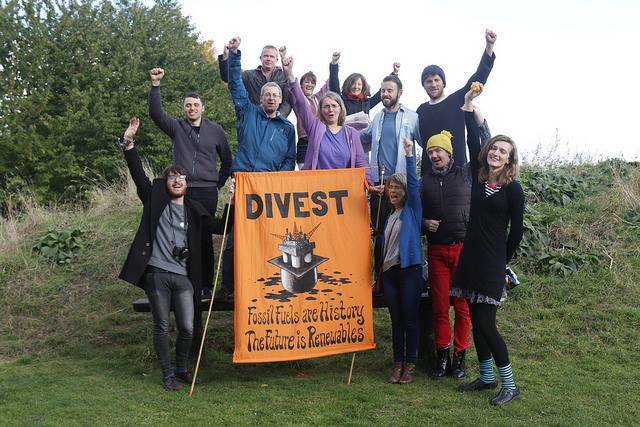 If you’re not sure where to get started with divestment from fossil fuels, begin with your bank account; most major national banks are heavily invested in fossil fuel companies that encourage unnecessary, harmful drilling and mining practices that exacerbate carbon emission levels. Consider opening a checking account at a local credit union or community development bank — two types of institutions known to invest heavily in their communities. Second, if you have a financial portfolio with stocks and mutual funds, here is a guide to fossil free investing put out by Green America. Other ways you can support clean energy financially are by utilizing alternative transportation such as bicycles and public transportation, driving a hybrid vehicle, or investing in a solar photovoltaic (PV) system for your home. Lastly, consider working for an organization that supports sustainability, or look into working with the sustainability director at your company — perhaps even becoming a sustainability or energy efficiency specialist. In fact, jobs focusing on ‘energy efficiency’ have grown by 500 percent since 2010. That’s not an insignificant amount, by any stretch of the imagination! You might also consider going into a career in human services, especially considering the need companies have for corporate responsibility outreach and marketing efforts aimed at reaching out to the community. You may be charged with ordering supplies produced with a sustainable carbon footprint, or working with local organizations to provide volunteer opportunities for employees to help clean up trash along a local river, or helping with community-wide recycling efforts. You may also be charged with ensuring that employees’ 401(k) portfolios are invested in clean energy, rather than fossil fuels. The marketing of these efforts is also good for business, since it will attract socially conscious clientele interested in working with sustainability-minded companies. What are some practical ways individuals and businesses — either in your own office or in your community — are acting to fight against loosened federal regulations protecting the environment? Share your experience in the comments section, below. Daphne Stanford hosts “The Poetry Show!” on KRBX, her local community radio station, every Sunday at 5 p.m. A writer of poetry, nonfiction, and lyric essays, her favorite pastimes include hiking, bicycling, and good conversation with friends and family. Follow her on Twitter @TPS_on_KRBX.